I did not purchase any fabric this weekend. Nor did I purchase any batting, rotary blades, needles, sewing machine, or anything else quilt related. I almost got through the entire sales period without buying a thing! Almost. My downfall was finding a bread maker for half-price at a local store. For many years, I've resisted getting a bread maker. But I had a strange reaction to the pain relief medication prescribed after my fall in October and since then many things have tasted funny. The worst has been store-bought bread, which now tastes very bitter to me. I'd hoped this strange effect would go away with time, but it's been 6 weeks since I quit taking the med and bread still tastes horrible. Thinking it might be the preservatives and so forth that I'm now tasting, I decided it was worth the gamble of buying a bread maker. I plan to test it out tonight. If nothing else, the home baked bread will be healthier and probably less expensive. If you haven't noticed yet, there's a new Sundrop Critter on my website. Well, I got a little sidetracked this weekend. My intent was to get the new critter done and get caught up on the applique/stencil patterns for the Home on The Range BOM. But when I realized Thanksgiving was so close, I decided to squeeze out a little time for just one new addition to my Thanksgiving page. 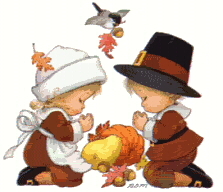 I drew a cute little Pilgrim outfit for my Pixiekin boy and added the pattern for it to my Thanksgiving page, but when I tried to upload the changes I found that page missing from my website! While looking for it, I noticed several other pages missing, too. So I spent a lot of extra time yesterday tracking down everything for my Thanksgiving page and uploading nearly all of it. 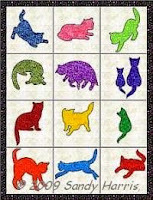 Oddly, the pdf patterns for the Dresden Turkey and Friendship quilt were already uploaded right where they belonged. I have a vague memory of losing a few things several years ago when I changed web hosts, and another vague memory of deleting old, old files because I was out of space, but surely I wouldn't have deleted something so important as Thanksgiving, would I? The rest of this week will probably be on the crazy side, so I'll wish you a Happy Thanksgiving now while I have the chance. Have a wonderful day! Enjoy the food (but don't overeat). And if you go out on Black Friday, please stay safe. Instructions for the 9th block for the Home on the Range BOM are now available on my web site. 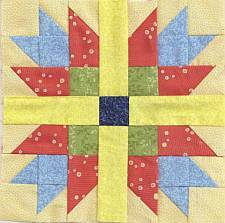 This block, called Old Fashioned Quilt, has 49 pieces but goes together quite easily. The 7-inch block that I made was even fairly easy! I think I'll be adding this block to my list of favorites. I like the "star within a star" effect that can be created. 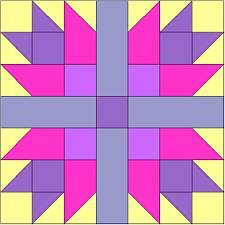 I colored the block below in pink and lavender to demonstrate the double star that I see: a pink inner star and an outer lavender star. This block could have great possibilities as a scrappy block.